Travel, illness and the holidays kept me away from this space at the end of 2012, but I’m so happy to be back here for 2013! Rob and I sat down and made a list of all of our goals for the next year, and it’s really exciting to see everything we’ve been talking about being written down. There are going to be a lot of changes in the next year, and some of those involve changes to this site, which I’ll need your help with! I hope to post about some of that soon, but right now I wanted to share a bit of the vintage goods I picked up while I was gone. 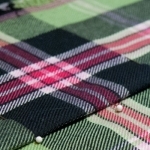 I’ll get back to my plaid posts soon enough, but I couldn’t help share these pages of wonderful imagery and information with you! 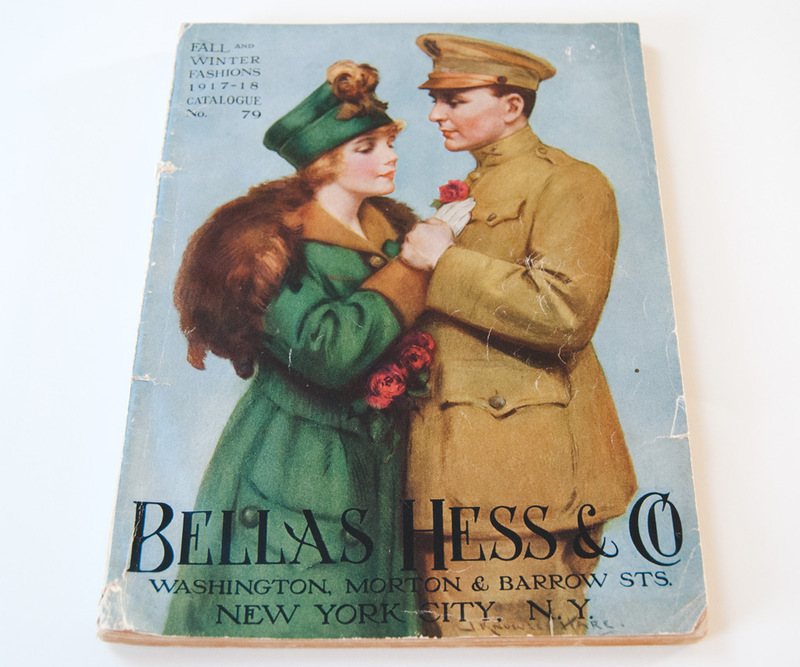 I found this Bella Hess & Co catalogue in the basement of an antique store. 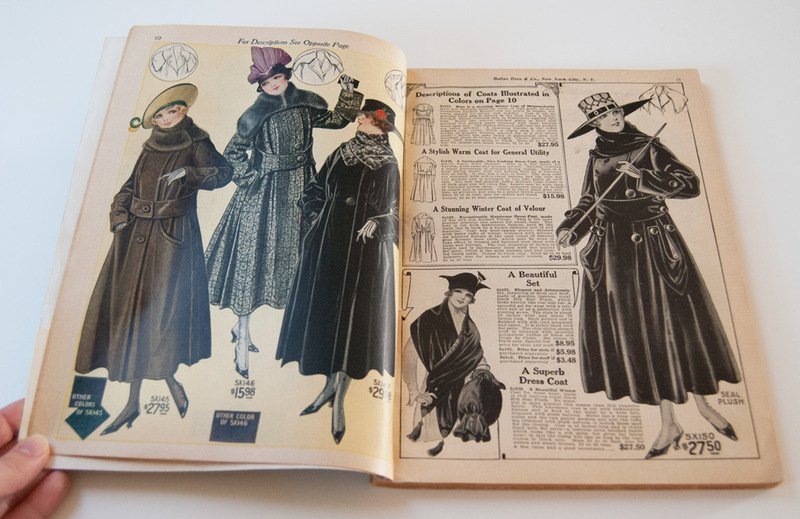 I’m not particularly drawn to this fashion period, as the catalogue is for “Fall and Winter Fashions of 1917-1918”, but the detail of the garments drew me in. I had to have it! It reminds me so much of the first two seasons of Downton Abbey, which I am absolutely in love with. Bellas Hess & Co actually went out of business in the 1970s, but they have a place not only in fashion, but in sales tax law, oddly enough. You can read more about that here. This catalog is filled to the brim with coats, day dress, evening wear, hats, fur sets, children’s clothes, men’s suits, shoes and everything else you can think of that you’d need for your wardrobe. I found an online calculator so that I could compare the prices in the catalog to today’s inflation and find out what they’d cost. What do you think you’d pay for these items as compared to what their modern day prices are? You can click on any of these images to see a bit more detail. 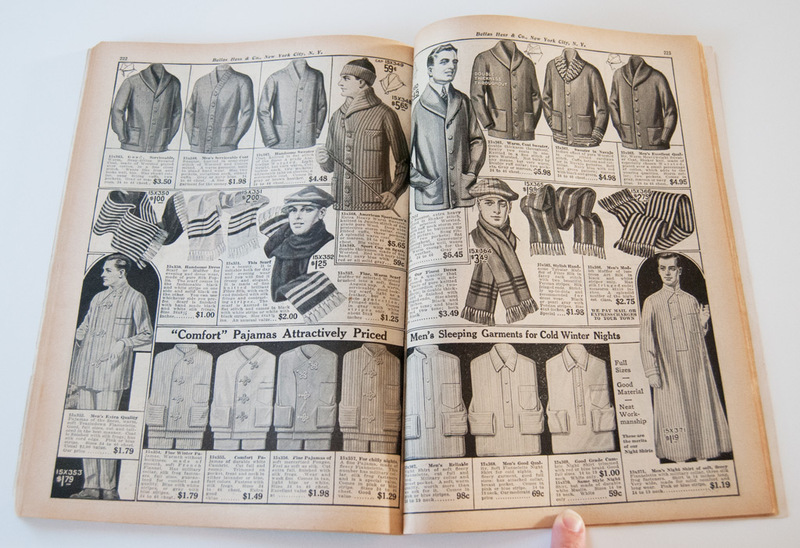 Coat, $19.98 in 1917, which is $388.70 compared to 2012’s dollar. Coat, $27.50 in 1917, which is $535.00 compared to 2012’s dollar. 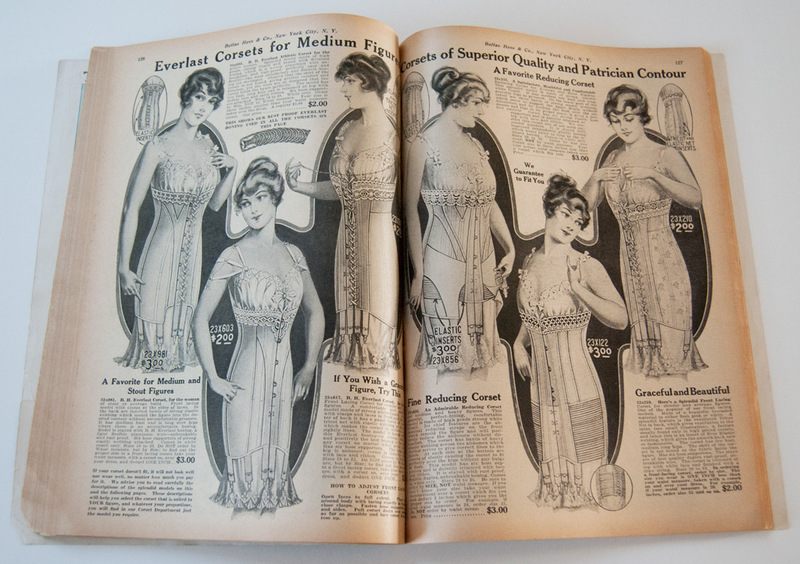 Dress, $24.95 in 1917, which is $485.39 compared to 2012’s dollar. 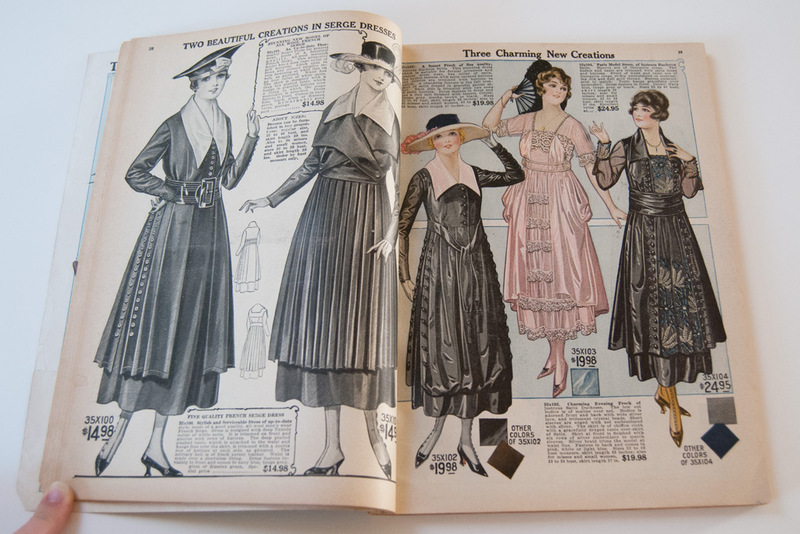 I would love to see one of these fancy afternoon dresses in person! I bet the details were absolutely stunning. 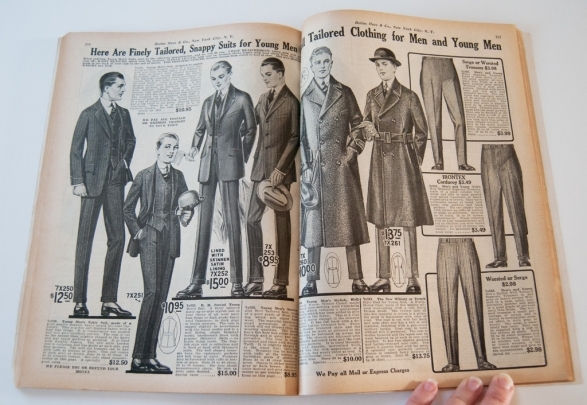 I had to include these pages because of that union suit…. you see it…. the one that’s meant for nursing?! I shudder to think of someone having to wear that under a corset. Speaking of corsets, I’m quite surprised these didn’t cost more. With the elaborate piecing, boning and hardware required to manufacture one, I thought they’d be well over $100. But perhaps they weren’t as well-made as they appear, much like today’s fashion. Corset, $3.00 in 1917, which is $58.36 compared to 2012’s dollar. 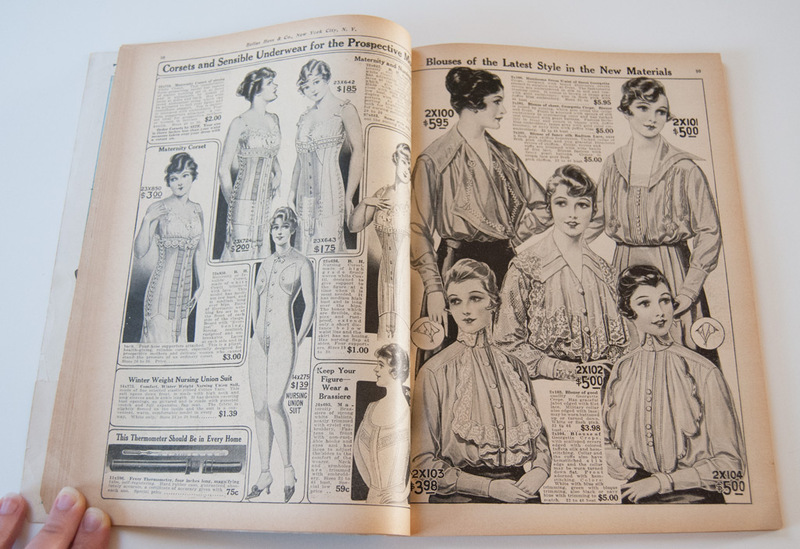 As I flipped thru the catalog, at first I thought the page on right had some kind of strange skirt printed on it. Then my eyes adjusted and the “ew” came out of my mouth. Yes, that’s real human hair, being sold for quite the bargain. 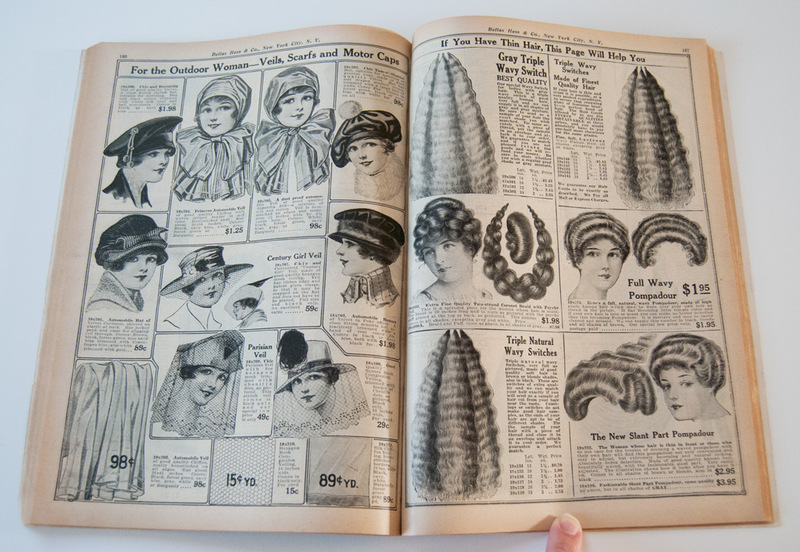 Hair extensions, $1.95 in 1917, which is $37.94 compared to 2012’s dollar. If you click on this image, it will open up so that you can see the detail of the blouses, shoes and girl’s dresses. It’s all very ornate, and the little dresses are incredibly sweet. Suit, $12.50 in 1917, which is $243.18 compared to 2012’s dollar. … and some very dapper sweaters. I find it funny that the sweaters in this catalog are the exact ones Rob is currently trying to find and buy. Fashion always comes full circle! Sweater, $4.95 in 1917, which is $96.30 compared to 2012’s dollar. 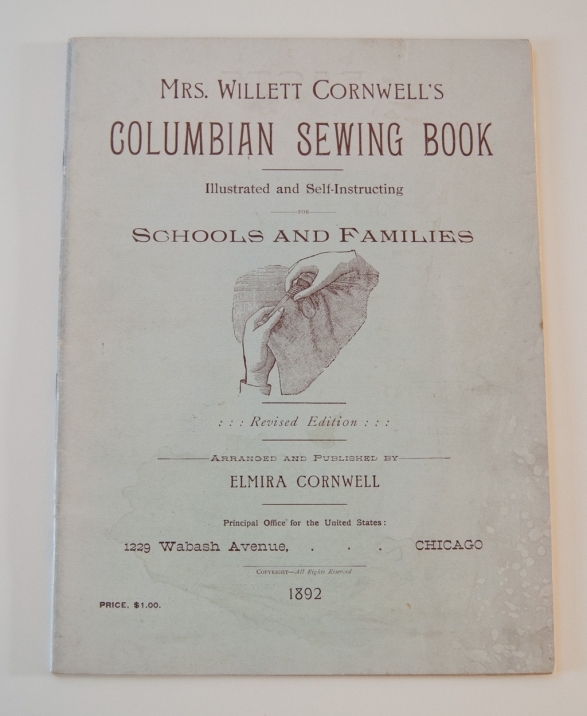 The second book that I found is Mrs. Willett Cornwell’s Columbian Sewing Book, from 1892. It is chock-full of wonderful dressmaking techniques and instruction, which I hope to scan and share here in the future. One of the best parts about this “instruction book” is the section on hand worked buttonholes. 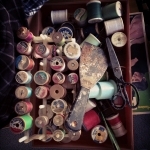 I have seen many postings online of seamstresses who have tried to figure out the exact methods for producing perfectly sewn buttonholes, but there a few secrets they have missed out on. I’ll be sure to share them! 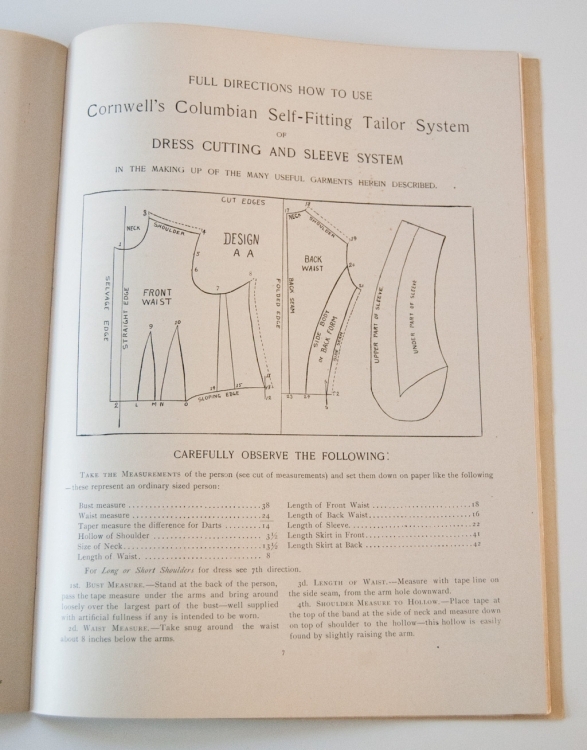 I love the part of this book that reviews patternmaking, and it would be incredibly useful for anyone who makes reproduction garments. There is a warning printed next to one diagram that reads “this instruction book is solely for the benefit of those using the Cornwell System of cutting, and none others. All persons are hereby warned not to profit or use, in any way, the rights and privileges of this invention.” Yikes! I can understand why they wanted to protect this information. Their method of pattern creation is quite unique and would make perfect silhouettes for the time period. I’d love to make the patterns someday, but it’s not very high up on my life list at this point. Perhaps some rainy day, though! And of course there are the ads in the back of the book. 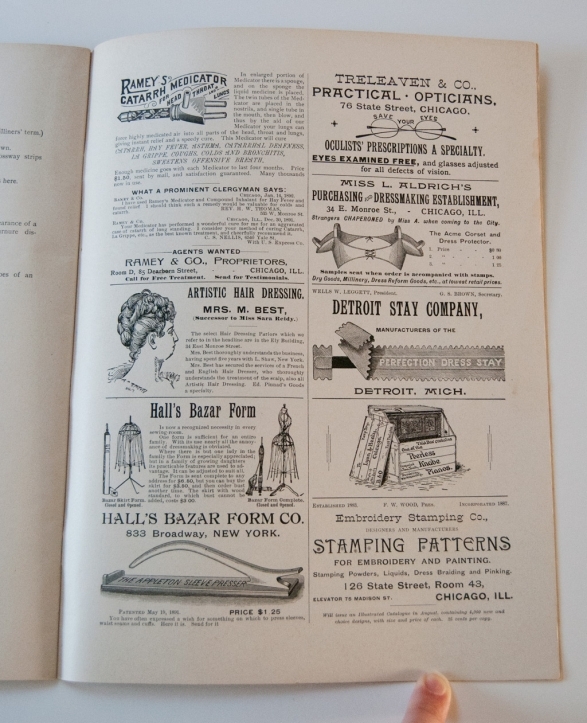 How could I not share “Hall’s Bazar Form” with you? I want it! 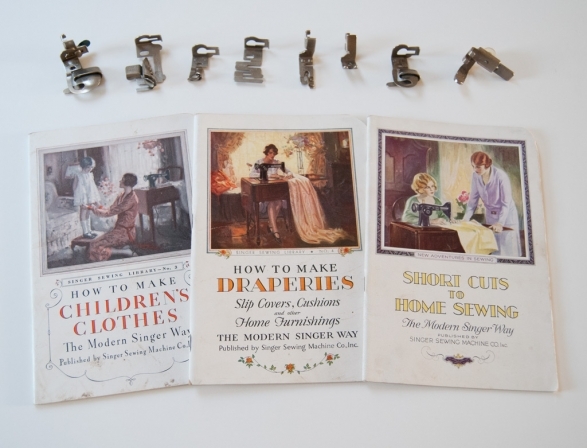 The last of my loot includes three Singer sewing books from the 1920s and 30s, and Greist accessory feet for my Singer 201-2 (who, yes, I still need to officially name). I’m taking the machine in to be cleaned and serviced, because the bobbin isn’t winding quite right. I’m excited to try out all of these new hemmers, and I’ll be checking local shops to see what other bits and pieces I can find for her. 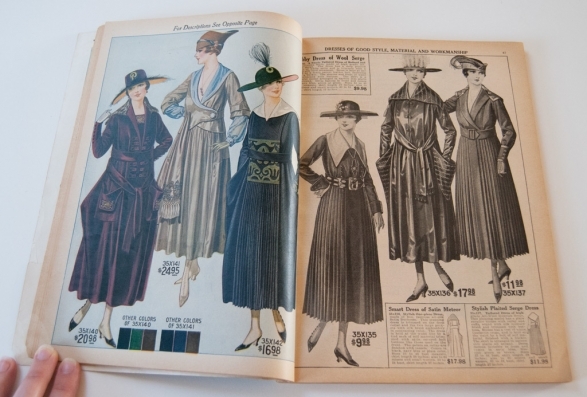 I hope you enjoy looking thru these catalogs and books as much as I do, and I look forward to sharing much more with you in 2013! Thank you for being lovely readers. I have appreciated your kind emails and comments so much this past year. I hope you continue to find inspiration here! This entry was posted in Life and tagged clothing, inspiration, vintage on January 2, 2013 by Amy Alan. That catalogue is an amazing find! I’m always in awe of women from the past and what they put up with for the sake of fashion. Thanks for sharing! I LOVE finding things like this. I haven’t let you look thru my vintage magazines yet, have I? You need to remind me to pull them out the next time you’re over- you’d love them! Oh, what a wonderful finds, Amy! I recently looked through a similar one, but Russian, Tsar era catalog (before 1917). It was amazing! The Tsar era catalog sounds amazing! Are there any scans or photos of it online? I LOVE finding things like that and “flipping” thru them, so to say. I would gladly pay whatever I had to in order to get my hands on that dressform! Wouldn’t it be so fun? Here are just two, Amy. There are no copyrights on them. The rest I have in .pdf files. Let me know if you are interested. Oh yes- very interested! You can send them to me at (amy @ reallyhandmade . com). I’m excited to look at these, but I’d better save them as an “I got all my sewing done” treat. Thank you so much! Love the vintage catalogue, I have an old pattern drafting book, with a tea cup stain & strange smell to it 🙂 Hope you have a lovely 2013! Glad you like it! 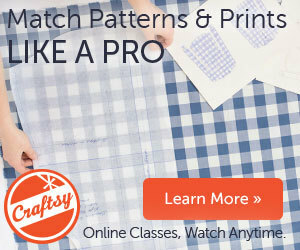 I would love to see some images of your pattern drafting book. The older, the better! 🙂 Happy 2013 to you too, Jennie! Thank you so much for sharing that catalog. Whoa, ready made clothing was really expensive! No wonder more people sewed back then. It would be interesting to find out the cost of fabrics. I wonder if I could goggle it? My husband and I did a similair thing on New Years Day–we reviewed the 2012 via notes on our calendars and day runners. I was really surprised when I did the numbers and saw how expensive everything was. 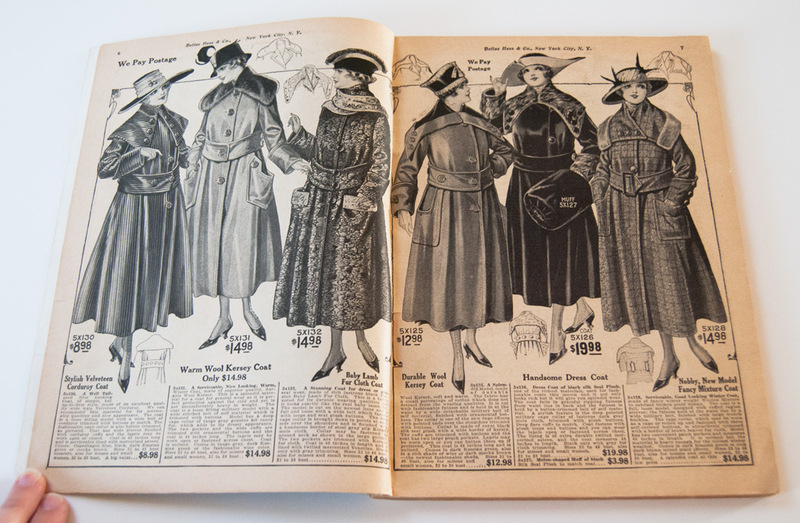 It makes me laugh to see coats and dresses that were made so well to be listed as being $10, which would get you junk nowadays. But then to do the math and see the real price?! Wow! It’s no wonder you had about four dresses that you stuck to! If I ever see fabric yardage advertised, I’ll post it. I’m curious about the price of fabric now, too!